I promised to withhold judgement on the deal reached between 3 of Canada's 4 major parties over the Afghan Detainee documents. The NDP walked away from the deal saying that the deal shields the most crucial detainee information from scrutiny. Go read for yourself. Jack Harris of the NDP puts it succinctly: “The things you need to know — What did the government know? When did they know it? What advice were they given? Did they follow it? — that’s the stuff we will never see." An example of the kind of advice the Tories would be getting from lawyers, information that they will be shielded from committee scrutiny under this agreement, is the issue of handing detainees over to the NDS, Afghanistan's infamous secret police. 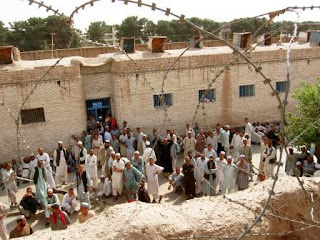 Paul Champ, a lawyer involved in the investigations into the alleged abuse of Afghan detainees said, "The NDS can't be trusted with detainees transferred into its custody by Canadian soldiers, and the Conservative government was well aware of this. ...the methods of the NDS are well known," Champ told CBC News. "It's electric shocks, it's pulling out toenails, it's beating people with chains, it's hanging them for days. So when someone says abuse, that's a euphemism for torture."